Philly Bird Nerd : Happy 2013! 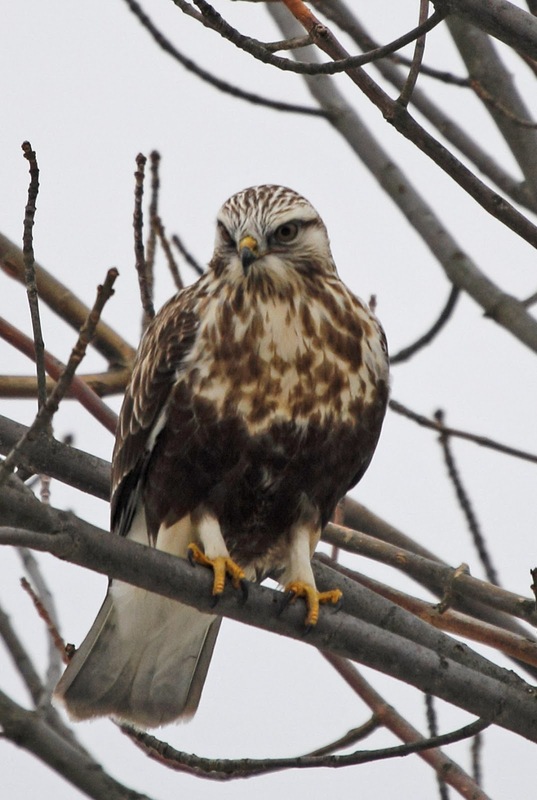 We went to Peace Valley Park (Lake Galena) on New Year's Day to find the Rough-legged Hawk that has been reported over the past few weeks. 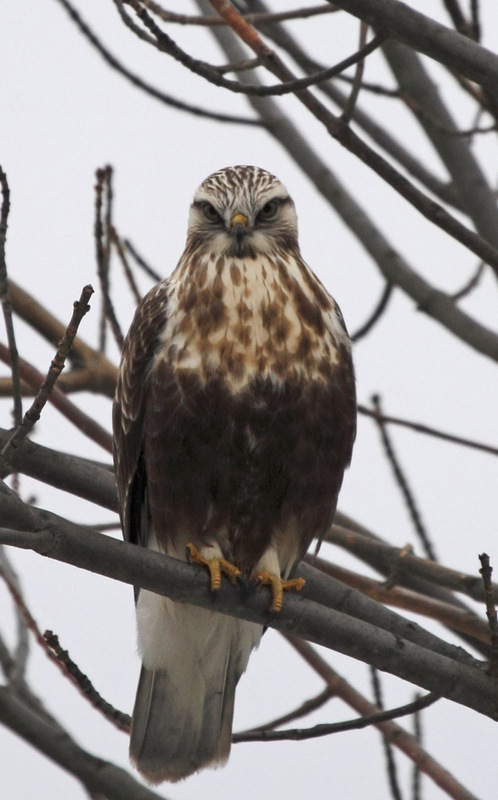 These hawks are rare in our area. They nest in the arctic tundra and winter in open fields usually north and west of PA. Bucks county would be at the southern edge of their wintering grounds. 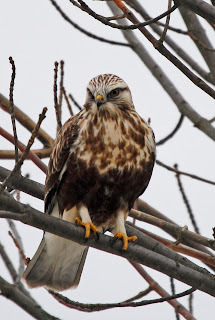 They are not as plentiful as our regular Red-tailed Hawks anyway, so seeing one is noteworthy. I am soooo glad that we made the trip. Di spotted a hawk in a tree almost immediately as we pulled into Sailor's Point parking area. We got out to the truck and tried to get a view of the distant bird but poor Barbara is still on crutches so I told them to get back in the car so we could drive up the road a bit. That was a lucky move on our part because the bird we were looking at was NOT the Rough-legged Hawk. How did we know? Because the Rough-legged Hawk met us at the top of the parking lot sitting in a tree about 20 yards from the entrance! WOW. We stopped the car right on the road and watched the bird for a few seconds thinking for sure that it would fly off but it didn't. Then, the weird part started happening - cars, trucks, bikers, and joggers went past this bird at varying speeds. The jogger even stopped to look at the bird while jogging in place. 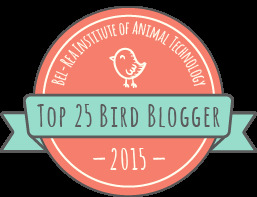 The bird didn't flinch. It didn't care one lick about the people and vehicles. It just sat there on its branch looking for rodents in the field. I got out of the truck and snapped a bunch of photos while standing at the driver's door. Then, I followed a few bikers up the road another 30 yards to get a different angle. The bird didn't care. I loaned the bikers my binoculars so that they could get a better look at the bird. You can tell immediately that this bird is different. No other hawk in our area has this black belly and lighter chest. 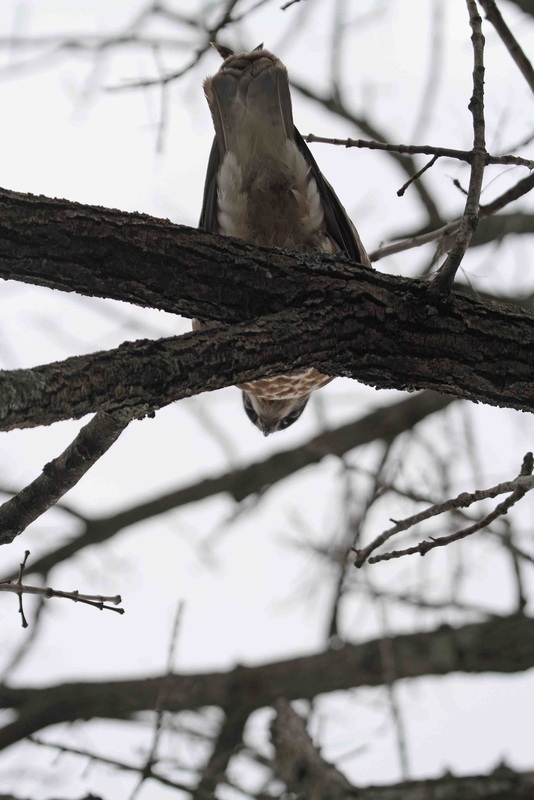 The first photo is full frame (not cropped at all) so that you can see how close we were to this hawk. Mind you, we were ON THE ROAD. We didn't venture into the woods chasing it. Occasionally, the bird would look right at us like in the photo below. This next photo really shows the reason for the name "rough-legged". 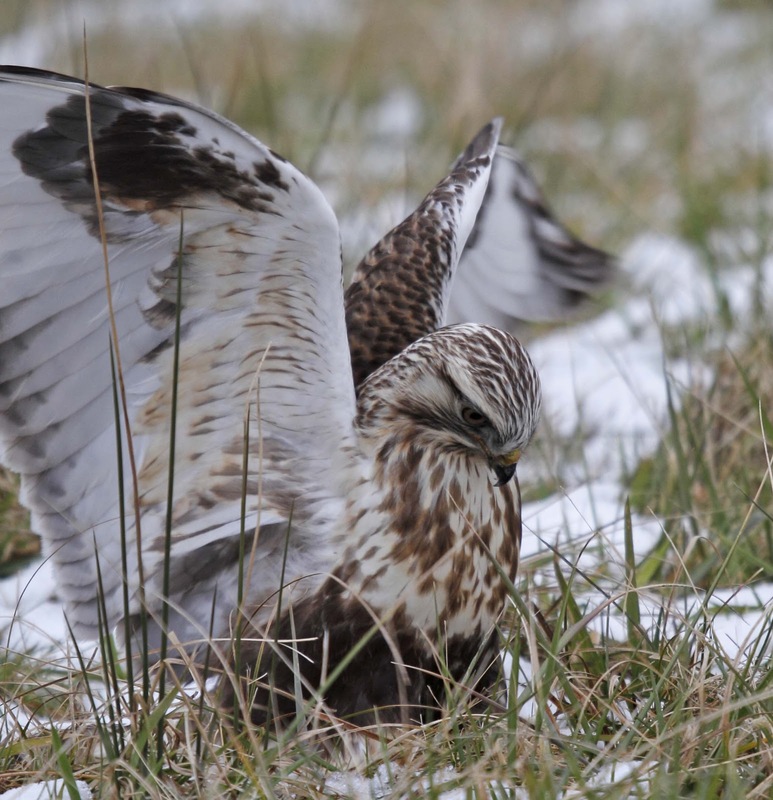 These hawks live in the tundra, so they need extra protection from the cold. They have feathers all the way down their legs to the feet just like Snowy Owls and Ptarmigans to keep the heat in. Check out those white spats. Just after that photo was taken, the bird took off and landed right in front of me and the bikers in the grass. It was trying to catch a meal. It stomped around in the grass trying to feel a vole of something. Again, un-phased by us humans standing 10 yards away gawking at it. The next photo shows the under-side of the wing pretty well. 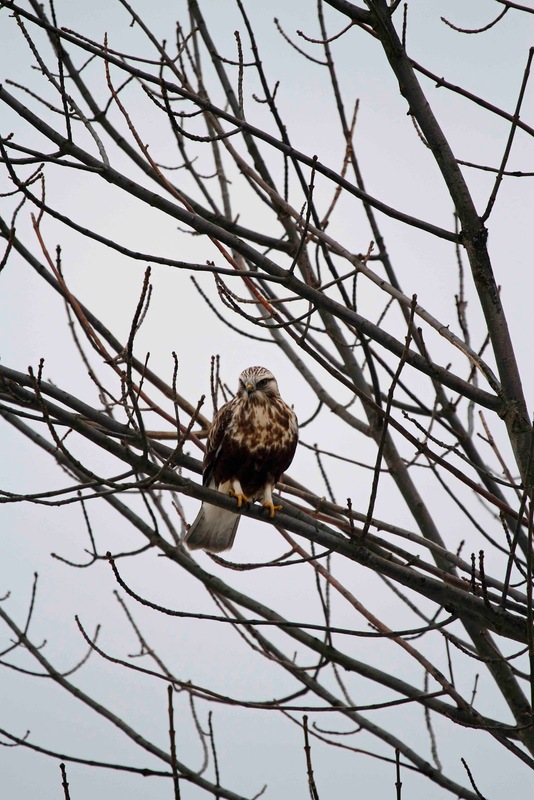 The next photo shows the hawk just before it took off and landed in another tree right above the road. Cars and trucks drove right under the hawk as it sat there. Barely 6 feet separated the top of the truck and the hawk's tail feathers. I couldn't resist snapping this next photo from the sunroof as we drove under the hawk! A New Year's event to remember! The only regret from the day was that it was super overcast which makes the photos kink of gray. 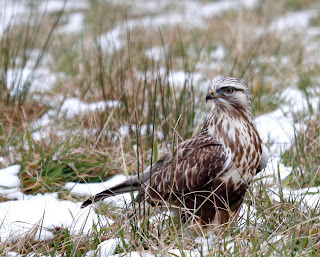 On the plus side, I like the snow in the background when the hawk is on the ground. WOW! You were in the right place at the right time. It has been said that it is all in the timing...and you seem to have that perfected. We are the bikers to whom you lent your binoculars. 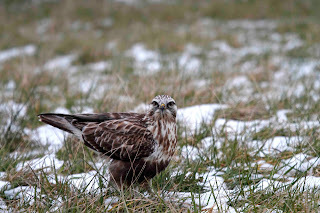 This rough-legged hawk is a life bird for me! Really glad we ran into you and your marvelous hawk up at Peace Valley.